Do you ever find yourself asking how something works? Well, that’s what my How It Works series have been all about, giving you the inside info on how something works. From hard drives to monitors to optics to processors, I’m covering it all. But this time, I’m going to touch down on something that’s a little bit different. Something that hasn’t been released to the public yet will be in subject today. What could it be? Today we’re going to be focusing on another type of storage technology. Last time it was opticals and before that it was hard drives. If you read my opticals articles you might remember in my conclusion I hinted at the continuation of the technology. This is the second installment of how optical storage works. But I’m 100% sure that you won’t have one of these devices installed on your computer. Has anyone seen my HoloCube? I dropped it somewhere and it has 47 ISO images on it, damn. By now you may have guessed that the topic today is holographic storage, but before we dive straight into the technology, I will tell you how holography works. It is a light wave interference pattern recorded on photographic film (or other suitable surface) that can produce a 3-dimensional image when illuminated properly. How is a hologram made? The width of the reference beam is increased conically by a lens or curved mirror and aimed directly at the film plate. The width of the object beam is increased and aimed at the object. The object reflects some of the light on the holographic film-plate. The two beams cross each other forming an interference pattern on the film. This is the hologram. Laser light is needed because it is made of coherent waves (of same wavelength and phase). 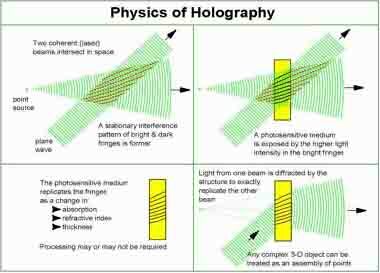 How is a hologram viewed? When the hologram is illuminated from the original direction of the reference beam, a 3-dimensional image of the object appears where the object was originally. Some holograms must be viewed with laser or monochromatic (single color) light, and others with white light. 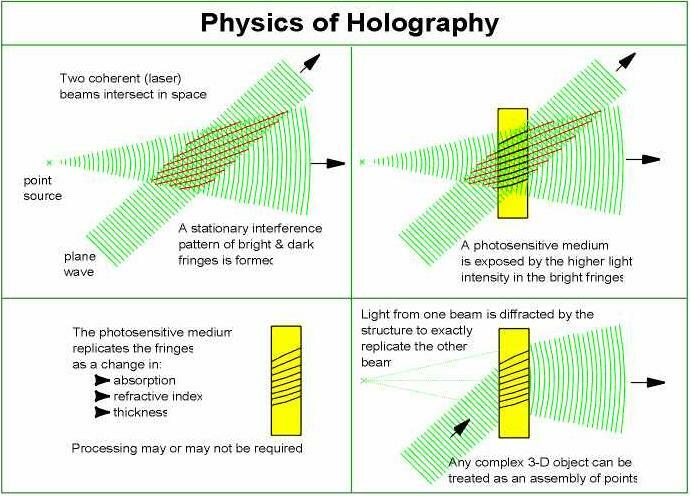 What are the main types of holograms? Transmission Holograms: Viewable with laser light. They are made with both beams approaching the film from the same side. Reflection (White Light) Holograms: Viewable with white light from a suitable source such as spotlight, flashlight, the sun, etc. They are made with the two beams approaching the holographic film from opposite sides. Multiple channel holograms: Two or more images are visible from different angles. There are different types of these holograms: simple ones with 2, 3, or a few images each viewed from a different angle. Multiplex: A large number of "flat" pictures of a subject viewed from different angles are combined into a single, 3-dimensional image of the object. This is also known as a Composed hologram. Rainbow holograms: The same image appears in a different color when viewed from different angles.